You have features and scenarios introduced as requirements in Test Collab and you want to know how well they are being covered in the project. 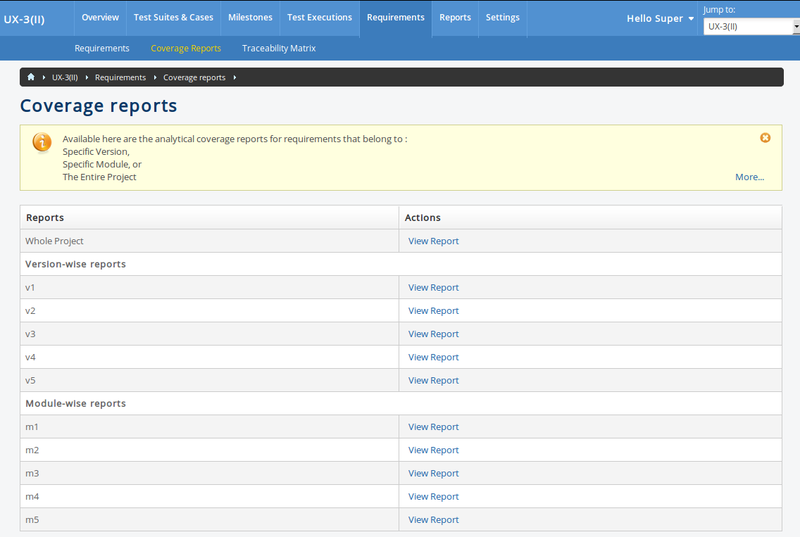 Get the analytical coverage reports for requirements that belong to a specific version, or a specific module or to the entire project, by using the "Coverage Reports" option. When opted to view a report listed on 'Coverage Reports' page, you will be shown coverage details for the requirements that come under the criteria you selected, i.e. version / module / entire project; to let you know about the number of covered and uncovered requirements. Covered requirements here mean the requirements that have at least one or more linked test cases. Uncovered requirements refer to requirements with no linked test cases, therefore it helps you know about the test cases that should be created to cover all the requirements. Coverage % (shown graphically) is the ratio of covered requirements to the total number of requirements in your project/version/module.